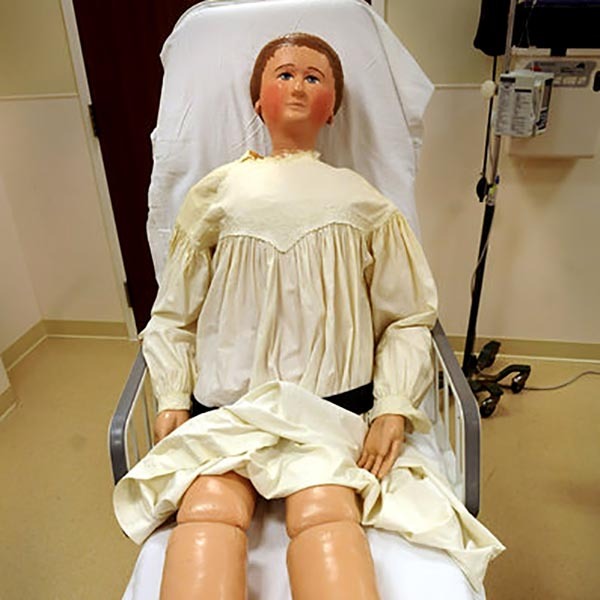 On my way to present an illustrated reading to the Hartford Medical Society this past March 2012, my host, Dr. Mick Bedard made me aware of a discovery that had just taken place at nearby Hartford Hospital of a one hundred year old medical training manikin named “Mrs. Chase.” (Read a Hartford Courant story about the discovery.) Its maker was a renowned doll-maker (also named Mrs. Chase) who founded her cottage industry in my own backyard of Rhode Island (Pawtucket, in particular). About a week before Mick informed me of this fascinating find in a hospital closet, I received an e-mail from a woman named Judy Comes who had worked for Dr. Charles Norris in the Norris-Jackson clinics at Temple in the 1960s. Judy, it turned out, was in possession of the Chevalier Jackson training doll that I’d seen so many times in the course of my reading and research: seated alongside Jackson in his textbooks, available for demonstration tracheotomies in his films, the doll was part of a history of medical simulacra. On a visit to Philadelphia to meet Judy and the doll — named “Michelle” — I learned that she was made by Jackson’s life-long assistant, and probable co-curator of the Chevalier Jackson Foreign Body Collection, Breton-born, “Mamselle” Angele Piquenais, who bequeathed the doll to Judy. Who was this woman — an eccentric force in the clinics — who, as early as 1919, traveled from a tiny seaside town in Brittany (Binic) to Philadelphia by boat each year to work alongside Jackson for the entire course of her life? What’s the difference, ontologically speaking, between a medical manikin, a puppet, and a voodoo doll? Why did Angele dress the demonstration doll in the uniform of a student nurse? If some people, horrified, turn away from her, why might others, like Judy and me, wish to know her better? These are some of the questions I’ll take up in a new book underway.